The market continues to shrug along all time high levels while underneath the surface the breadth is telling us that its walking on a tight rope. Based on the stats that I follow the market’s breadth is extremely narrow with a couple of sectors leading the way, specifically Biotechnology/healthcare. So far every single bearish divergence over the last few years have resolved themselves to the upside with stocks catching up to the indices. Many years ago the type of divergence we are seeing now for the most part led to some form of correction in the indices, a normal correction, nowadays sector rotation takes care of all the divergences. 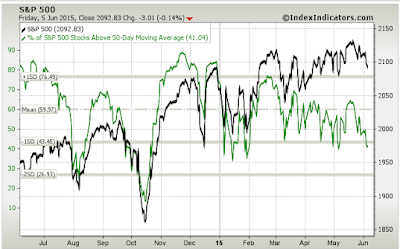 I’m a believer that 99% of negative divergences should be ignored in a bull market. However, in this current situation when I put all the pieces together that show me all the divergences there is one stat that made me put on a short trade to take advantage of a possible pullback in the short term. Below are the charts that show all the divergences that should be ignored 99% of the time, the last one is the game changer. Game changer in the short term; currently we have 25 stocks up 50% or more in the last month. 13 of those 25 stocks are in the biotechnology/healthcare sector. When we get over 20 stocks up 50% or more in a month its usually in a time when things are clicking and the market is somewhat overheated. Clearly based on the stats above and the fact that the SP500 is barely up for the year we all know that the market surely is not overheated. 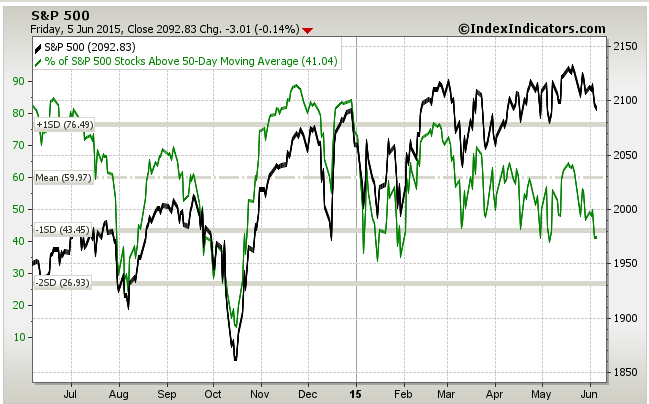 This latest stat (stocks +50% for the month) versus the stats above really shows you how narrow breadth has become. I recently took a short position on the SP500 via long SPXU (3X inverse etf) based on the stats above coupled with the game changer stat. I sold 20% of my entire position, I plan to sell more into strength or if it falls back to break-even, which ever comes first.